Out of all the thousands of benchmarks out there, sometimes the simplest can be most effective. Pifast has featured in our reviews for longer than we care to remember, and with good reason; the lightweight number-crunching benchmark stresses a single core by calculating Pi to 10m places, making it a very reliable indicator of a PC's raw speed. It's a handy test to have, and with many apps and games still dragging their feet in terms of multi-core utilisation, serves as an easy way to identify a quick platform. We reckon any system completing the benchmark in under 20 seconds can be deemed fast, while a sub-15 score, as evidenced above by our overclocked Core i7-8700K test platform, is blistering. For this week's question we're intrigued to see where you stand. 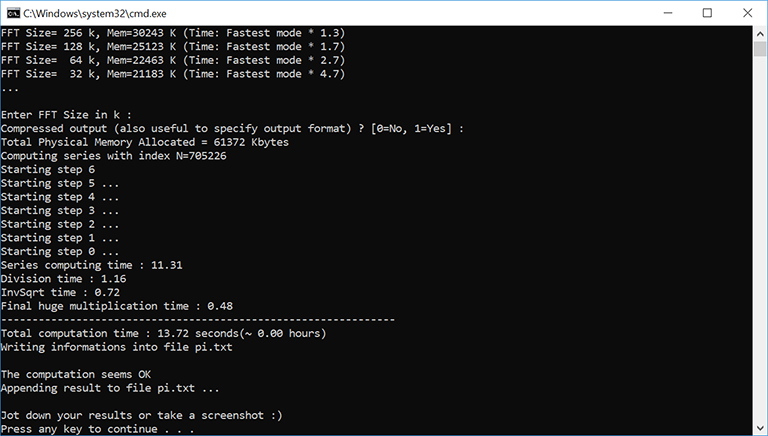 To get in on the action, download Pifast using the link below, extract the files, run hexus_pifast.bat then let us know which chip you're using and your total computation time. Remember, lower is better, so get your rig in an optimal configuration to help bring down that time. 3.141592653 in around a second and then I ground to a halt….I've clearly slowed over time because I used to be able to go to about 15 decimal places in the same time. Oh.. you mean my pc, doesn't really matter it will be the same as any other stock i7 4790k in all likelihood. phenom II x6 1090t @stock 3.2ghz, 16GB 1600MHZ ram. 16.61 timing on my older and trusty i7-4790 running at 4.0 Ghz stock.